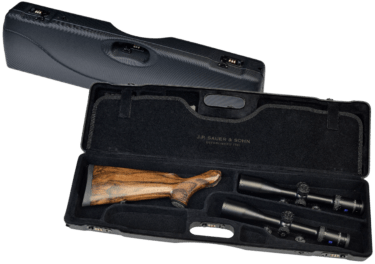 An ingenious rifle has deserved an ingenious case that perfectly combines maximum protection, minimum dimensions and an elegant design. No matter which model you choose – these beautiful and practical companions are only outperformed by their content. 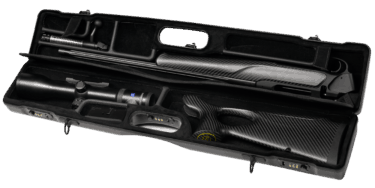 Its thought out modularity makes the Sauer 404 the perfect travelling companion. Especially for this purpose we have designed a perfect and inconspicuous transport case with extremely handy dimensions of only 83x16x12 cm (32.7×6.3×4.7 ˝ ). You cannot transport two firearms more comfortable or discreet than with the ABS Compact Case II. 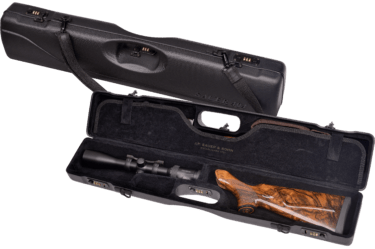 Featuring outer dimensions of 83x24x13 cm (32.7×9.4×5.1 ˝ ), the Compact Case II provides ample space for one firearm including interchangeable barrel and second rifle scope as well as the Titanium Pro silencer and the Flexpro bipod. The carbon case is a true high tech statement when it comes to technology and design. It is not only a must-have for the owner of a S 404 Synchro XTC, but also for those enjoying the best materials and a premium look.